Bolivia plans to open an embassy in Turkey to cement bilateral relations, Anadolu Agency cited Turkish presidential sources as saying late Wednesday. During the meeting, they acknowledged that significant progress had been made in their countries’ relations after Turkey opened an embassy in Bolivia last year. 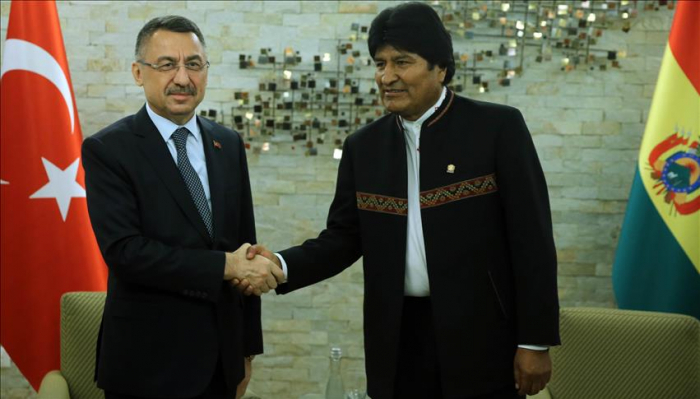 Separately, Morales said Bolivia fully supports Turkey in its fight against the Fetullah Terrorist Organization (FETO), the terror group behind the July 2016 defeated coup. FETO and Fetullah Gulen, the U.S.-based leader of the terror group, orchestrated the defeated coup in Turkey of July 15, 2016 which left 251 people martyred and nearly 2,200 injured. In addition, Oktay presented Turkish President Recep Tayyip Erdogan's invitation message to Morales to visit Turkey. Oktay arrived in Venezuela’s capital late Wednesday to attend President Nicolas Maduro’s inauguration ceremony.